If it’s buttonholes for weddings in London, then you’ve come to the right place. Todich Floral Design sets a high standard for every component of your wedding, from the bride’s flowers and the glamorous wedding centrepieces, down to the last stem and petal in your wedding decor. 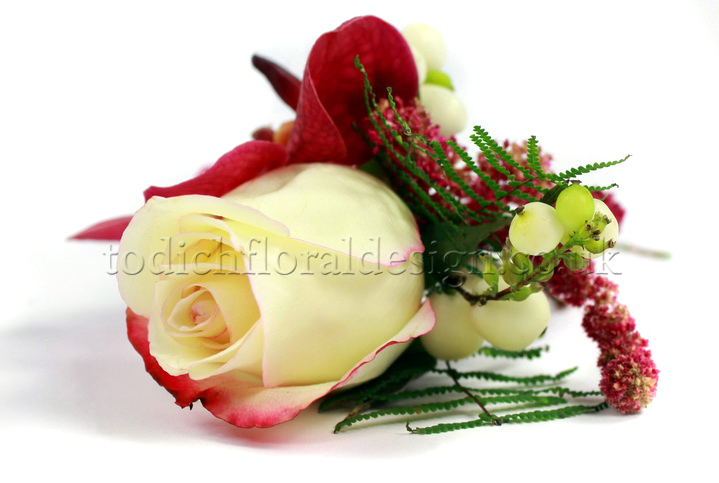 Buttonholes for weddings in London and the UK can go according to wedding flowers by season, be matched up with your other wedding flowers, and you can always figure out ways to keep wedding buttonholes and corsages in line with your overall wedding budget. Wedding buttonholes, also known as boutonnieres (from the French), are traditionally worn over the left breast lapel for the groom and groomsmen. Buttonhole flower ideas can really include include a wide range! Some of the more popular, fashionable blossoms at the moment are ivory roses, miniature pink roses, sweet pea flowers, and lilac flowers for accents. Other ways to finish floral buttonholes and corsages can include Baby’s breath flowers (gypsophilia), rosemary for an aromatic flare, lots of natural style or rustic wedding flowers, and parchment paper or twine wrapping. 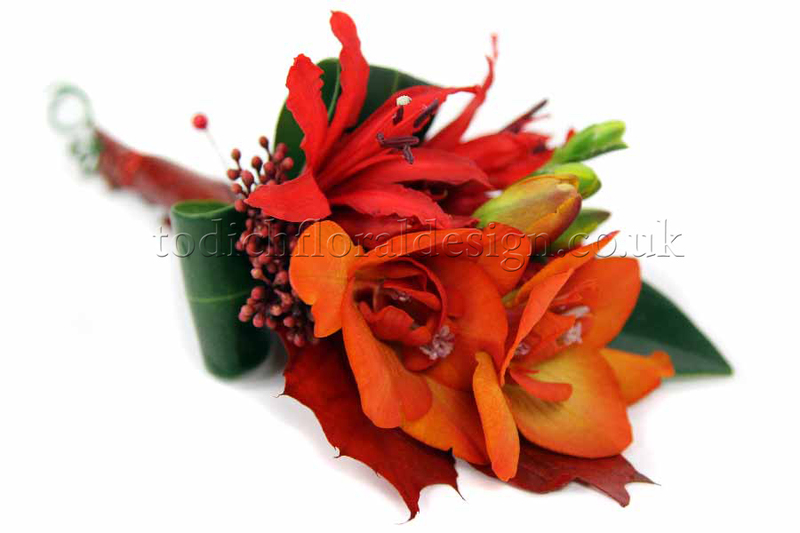 For brides’ wedding corsages, bridesmaids and even wedding corsages for mothers you will find an equally fabulous if not more stunning array of corsage flowers and finishing touches. There is always the option for something more elaborate or leaning toward the simpler side. It is really up to you, what your preferences are, and what other flowers you have chosen for your wedding. 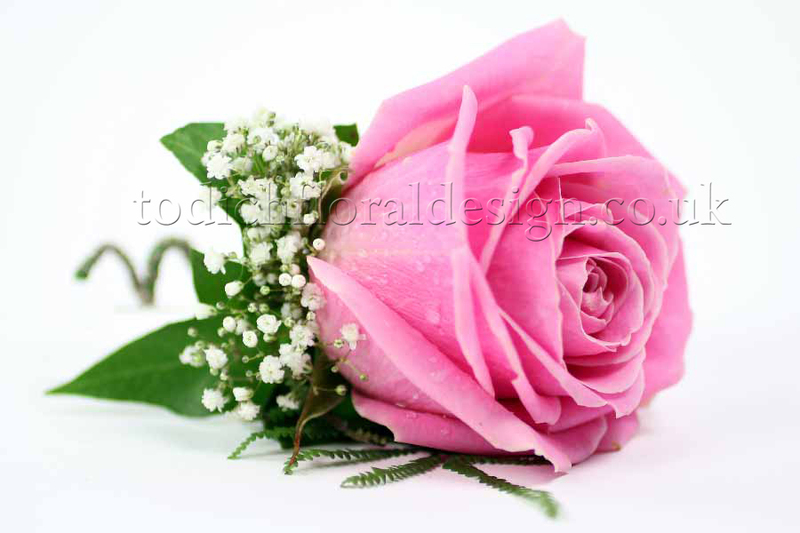 If you want basic corsages ideas that cover essential flower styles and colour combinations, try dark pink roses, bi-coloured pink and white roses, peach and cream colour combos, or purple and lavender two tones. All of these are beautiful spring wedding flowers, or work equally well for early summer weddings. Round out or add a colour pop to your buttonholes and corsages ideas with lisianthus or astrantia floral accents, wax flowers, as well as tiny additions of greenery and foliage. There are also whole assortments of more exotic and somewhat wilder, more natural flowers that fit perfectly into wedding flowers buttonholes and wedding corsages worn for spring weddings and natural themed weddings. 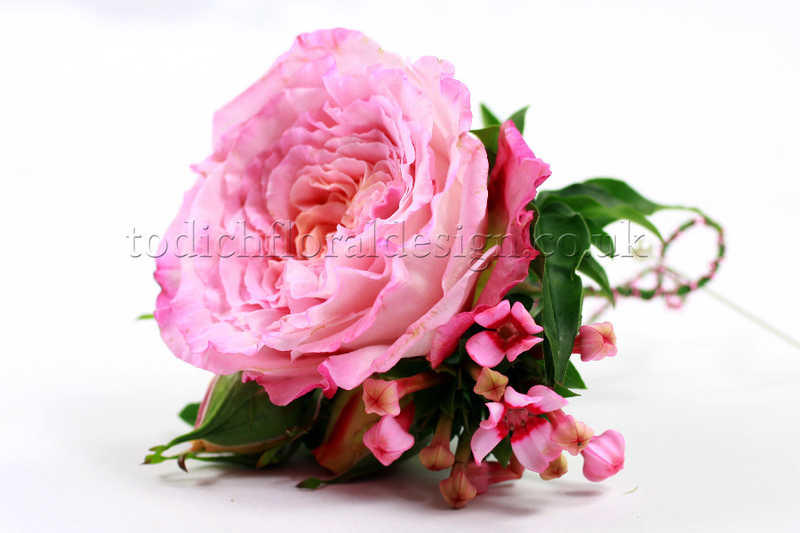 They also come out beautifully in photographs taken at outdoor receptions and rustic or countryside venues. Calla lilies, wild grasses and mother of pearl (or shiny pins and buttons) blend into a floral buttonhole with an extravagantly fey appearance. Orchid corsages as well as pale pink or red rose wedding corsages can be paired up with loops of wild grasses, bunched profusions of foliage, and smaller wildflowers for a lush and cascading effect.